@lindsaylohan GREAT NEWS! I am going to be filming more scenes that have been written for me in Machete next month! I am so excited!!!! This will probably do as great as that film about her being a murdered stripper. Ex- Mrs. Eddie Murphy Throws Music Producer Out! Just a day ago reports came out that Kim Kardashian's ex-husband, music producer, Damon Thomas used to physically abuse her. Well, he's in the news again...this time with Eddie Murpy's ex-wife, Nicole Murphy. The former model wants Damon OUT of her house! Surprise, surprise. Has anyone seen what this guy looks like? I wouldn't want to touch him with a 200 ft. pole, let alone a 10 ft. one! TMZ has obtained eviction papers filed by Nicole Murphy, in which she claims music producer Damon Thomas has been habitually skipping out of his $30,000 monthly rent payment to live in the ultra-exclusive Southern California community where Britney Spears and other stars call home. According to the docs, filed last week in L.A. County Superior Court, Murphy claims Thomas is behind a grand total of $114,500. But TMZ spoke with Thomas, who tells us he’s actually trying to buy the home — and the rent dispute is the byproduct of a nasty negotiation. Thomas also tells us he has since paid his debt to Murphy. For those of you who don't know who Mr. Thomas is...he was behind the 2006 Dream Girls soundtrack. He's worked alongside artists P!nk, Tyrese and Baby Face. It really doesn't matter who he is...he seems like such a loser. 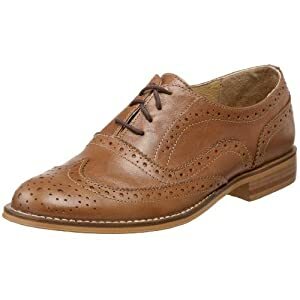 Today I sported my newest purchase...my Steve by Steve Madden "Melin" oxfords. Not only are these babies comfy, but they offer a little twist to my Casual Friday emsemble. I'm excited to pair these bad boys with a cute pair of shorts this spring or a cute summer dress. I'm not the only one enjoying these cuties either. Magazines like Glamour, US Weekly and many more are spotting this fashion trend and many celebs are turning to this old-school classic instead of ballet flats. A million apologies blogger friends, please excuse my absence. Life's been a little bit of a rollercoaster lately and it seems aparent that I'm NOT the only one. Lindsay Lohan.....you never cease to amaze me with your out-of-control-life. It actually makes my issues feel miniscule. For those of you who don't know....Lindsanity (referred by the lovely Perez) has just lost her mind...well the entire Lohan family for that matter. The more recent news in the actress's life is that she's a suspect in $35,000 rolex watch theft. Reports say the actress was questioned by LAPD about the watch. The watch is believed to be a friend's who says the watch went missing after being at Lohan's crib. Supposedly the watch has been missing for a few months. Are you kidding me? If I lost a $35,000 watch I would not have waited a few months to talk to authorities. First of all....I wouldn't have even allowed it to go missing!!! An article in the San Jose Mercury News says, "Lohan's attorney confirmed that Los Angeles police questioned Lohan but asserted the actress had done nothing wrong. "Lindsay has cooperated with police in their investigation," attorney Shawn Chapman Holley told E! Online. "We adamantly deny these allegations. As far as we have been informed, she is not a suspect." No arrests have been made." This come just a day after Father of the Decade, Michael Lohan, was worried about Lindsay's little sis Al'i's well-being and had L.A. County Sheriff's Deputies storm the actress's apartment. Lohan's been taking her business to the Tweets..airing her family's dirty laundry. @LindsayLohan protection here is ME AND ALI from our pathological, lying ex-father! @LindsayLohan are PUBLICLY humiliating your OWN CHILDREN AND MOTHER OF THEM!!! @LindsayLohan my friend @lianalevi doesn't drive 100mph!! my dad is the one who drove into a telephone pole!!!! hello! i'm not up ALL NIGHT!!! stop lying! Jeez...and the plot thickens....stay tuned for more madness from the Lohans. The Associated Press says the rock star is in critical condition after being rushed to the hospital after having a severe headache. It's been reported that doctors discovered bleeding at the base of his brain stem. Just last week he was admitted to the hospital for an emergency appendectomy and now....a brain hemorrhage! Michaels is currently a star contestant in the third season the Donald Trump's Celebrity Apprentice. We wish you well, Bret!